Attorney Corey Hanrahan is a San Diego employment law attorney dedicated to helping employees who have been treated unlawfully. He worked as a trial lawyer at one of San Diego’s most well-known plaintiff’s civil litigation firms before founding The Hanrahan Firm. He is an experienced litigator who has represented clients in a wide variety of employment matters. He has litigated hundreds of sexual harassment, disability discrimination, wrongful termination, whistleblower and wage and hour cases. He has successfully litigated claims against some of the country’s largest employers, as well as against international companies. He has a proven track record of success inside and outside of the courtroom. He has numerous six-figure and seven-figure settlements and verdicts. Corey Hanrahan brings the experience and tenacity of a larger law firm to the intimacy of a boutique law firm setting, giving each case and client the attention they need and deserve. 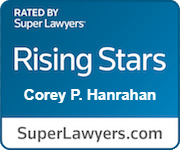 Contact Corey Hanrahan of The Hanrahan Firm today for a free consultation and evaluation. Corey Hanrahan is also the co-founder and President/CEO of Team Hoyt San Diego. Team Hoyt San Diego is a 501(c)(3) non-profit organization that provides assistance to persons with disabilities to allow them to compete in athletic events, including running races and triathlons. Team Hoyt San Diego allows Corey Hanrahan to give back to the San Diego community. Corey is also an avid distance runner. He has placed in the top 100 finishers in several San Diego half marathons. He has also run the Boston Marathon as a charity runner for the Hoyt Foundation four times, while raising money to help persons with disabilities.